U.S. Grant's capture of Forts Henry and Donelson in February 1862 made Kentucky and western Tennessee untenable to the Confederates, forcing them to withdraw southward, and dashing their hopes of using the Ohio River as an easily defensible barrier against invasion. After the failed Confederate attack on Grant at Shiloh, and the subsequent Union capture of Corinth, Mississippi, Union forces under Don Carlos Buell moved east toward Chattanooga, the capture of which would have put virtually all of Tennessee into Union hands. Drastic action was required to restore the situation. While Van Dorn and Price diverted Union attention around Corinth, Bragg shifted his Confederate army east toward Chattanooga. At Knoxville, Kirby Smith's Confederates began moving north, forcing the Federals at Cumberland Gap to withdraw. From near Chattanooga, Bragg began the march north into Kentucky, with Buell's Yankees also moving north in response. At Munfordville Bragg cut of Buell's rail supply line from Bowling Green to Louisville, but the Union commander did not attack Bragg and instead marched around him to the safety of Louisville. Meeting up with recently recruited troops at Louisville, Buell might have been content to allow Bragg's supply difficulties to force him to retreat. Pressured by the Lincoln administration, however, Buell advanced east. Bragg's Confederates hadn't gotten the welcome they had hoped for from Kentuckians. Although plenty were sympathetic, few actually joined the army. There was still opportunity for the Confederates, however. Bragg hoped to cooperate with Kirby Smith and fall on a portion of the Union army. Confused over exactly where the main Union army was, Bragg ordered a corps under Leonidas Polk at Perryville to attack and defeat the force to its front, then move north and join the rest of the Confederates to defeat another the Union force. Unknown to Bragg, Polk faced not a detachment, but Buell's whole army. At Perryville, on the morning of October 8th, Buell's army attacked Polk's left flank along the Springville Pike with Gilbert's III Corps, hoping that newly arriving troops would continue the attack further north. Union efforts were frustrated, however, and the attack was postponed. Nevertheless, significant Union forces faced Polk along three roads heading east into Perryville. In addition to Gilbert's men, Crittenden's II Corps was on the Lebanon Road to the south, and McCook's I Corps was to the north on the Mackville Pike. Bragg arrived at Perryville, and to his great anger found that Polk had not attacked. Focusing on the Union troops along the northern road, the Mackville Pike, Bragg sent Cheatham's Division north to move into the Union left flank while Buckner's Division would later attack frontally across Doctor's Creek. Unknown to Bragg, he was outnumbered 55,000 to 16,000, but his plan would concentrate his forces against only a portion of Buell's army, McCook's 13,000 man corps. Wharton's cavalry preceded Cheatham's Division. Moving down the modern Battlefield Road, the cavalry clashed with Union skirmishers near the entrance to the modern park, and advanced up to the ridgeline. Due to the exact timing of the event, and the viewing angle, Wharton misjudged the location of the Union flank. This would have a vitally important impact on the fight since Cheatham's Division wouldn't turn the Union position as intended, but would instead attack into it. Although the Yankees spotted a dust cloud to the north, they believed that the Confederates were retreating. So when Cheatham's division climbed up out of the Chaplin River valley and into the Union flank, surprise was achieved. Further, because of atmospheric conditions, Buell could not hear the battle and sent no help to his embattled men on his left flank until late in the day. It was now around 2pm. Donelson's brigade attacked roughly along the axis of the modern park entrance road, reaching nearly as far as the Widow Gibson house. Later, Maney crossed the ridge, further to the right in an advance on Parsons' Ridge, where Union artillery had enfiladed Donelson, then on to Starkweather Hill and beyond. Stewart's brigade would take cover behind the ridge until they advanced in a single line, overlapping Donelson's command and connecting with Maney. 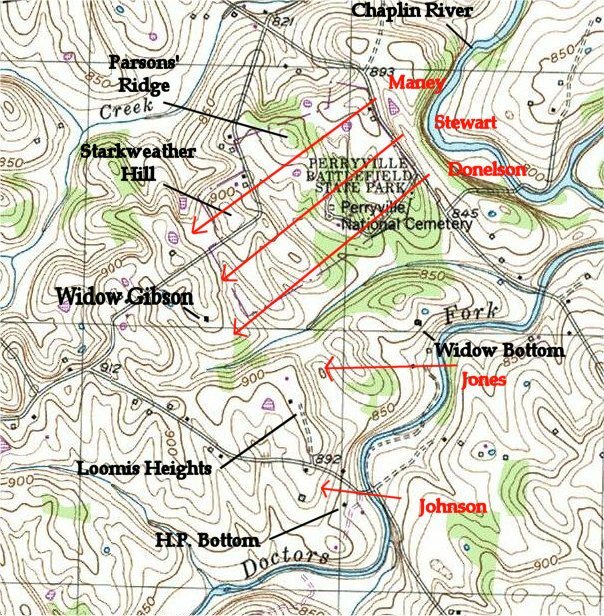 After Donelson's brigade began the advance, Buckner's division attacked frontally across the drought reduced Doctor's Creek, with Jones' brigade engaging Union troops on Loomis Heights after crossing what is now known as Jones Ridge. Bushrod Johnson's brigade would attack at the H.P. Bottom House, and other units would follow. Faulty intelligence complicated Confederate efforts from the beginning. Thinking that it marked the flank of the Union line, Donelson's brigade was ordered to capture Harris's battery, some distance away. Advancing roughly along the axis of this mowed trail, Donelson's brigade became somewhat confused during the advance and met a line of Federal infantry on the ridge visible here in the center of the picture. Fire from Simonson's battery on Loomis Heights to their left also found the Confederates as did fire from Harris's battery. Artillery fire from Open Knob, now known as Parson's Hill, the far end of the ridge visible on the right of the picture, then tore into the flank of the brigade, surprising the Southerners. It was now obvious that Donelson wasn't advancing into a vulnerable enemy flank, but Cheatham ordered them to continue forward while the brigades of Maney and Stewart dealt with the newly discovered battery on Parsons' Ridge. By the end of the battle, Donelson had lost around one in five of his brigade, with losses of up to 60% in one regiment.